Major League Baseball has suspended Toronto Blue Jays closer Roberto Osuna 75 games for violating the league’s domestic violence policy. Osuna was arrested and charged with assault on May 8. He was almost immediately placed on administrative leave while the league investigated the incident. Despite the issue remaining unresolved from a legal standpoint, MLB has handed down a suspension. Osuna’s suspension will be retroactive to May 8, so he will get credit for the games he’s already missed. However, he won’t be eligible to return to the Blue Jays until August 4. He will lose roughly $2.54 million of his $5.4 million salary. Osuna has no plans to appeal the suspension. He will also participate in a comprehensive evaluation and treatment program that’s supervised by MLB’s Joint Policy Board. Osuna is set to appear in court on July 9. According to his lawyer, Domenic Basile, Osuna is planning to plead not-guilty. Osuna was released on bail soon after his arrest. He’s been working out in Florida away from the team since then. He has been ordered not to have any contact with the victim. The identity of the alleged victim has not been released publicly. MLB’s suspension of Osuna is notable because of its length. MLB has suspended several players following arrests for domestic violence, even if no charges were eventually filed. However, the longest suspension ever handed out was the 51 games served by Jose Reyes in 2016. Prior to his arrest, Osuna was in the midst of an impressive season. In 15 appearances, the 23-year old Osuna had a 2.93 ERA, converting nine saves in 10 opportunities. At the time, the Blue Jays also had one of the best bullpens in the American League. However, things have gone downhill for the Blue Jays since losing Osuna. Toronto’s bullpen is now in the bottom third in the American League in ERA. Both Tyler Clippard and Ryan Tepera have been given an opportunity as the team’s closer. Tepera has taken to it recently, but the Blue Jays clearly miss Osuna’s presence at the end of games. Of course, with or without Osuna this season, the Blue Jays were always going to have a hard time staying competitive this year. Toronto is a distant fourth place in the AL East and is likely to be a seller this summer. By the time Osuna’s suspension is over, there will be little he can do to make a significant impact on the Blue Jays this season. More importantly, Osuna’s legal situation remains unclear. If he does indeed plead not-guilty next month, he could end up going to trial. That is not something players like Reyes have faced. 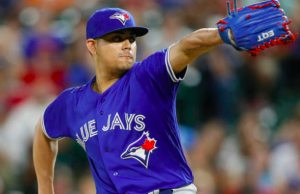 While the 75-game suspension clears up his status with Major League Baseball, Osuna’s future as it relates to his arrest in May is anything but certain.